Here is a snippet of Reavers of the Tempest, the sequel to my dark epic fantasy novel! Nrein lifted his spyglass, a tube of leather rolled about a pair of glass lenses. The Arshion, name painted in black on the stern, leaped into focus. The wallowing Vionese whaler soared above the ever-churning Storm Below through Thugri Sound, the passage that ran between the Autonomy-held Fringe to the south and the Agerzak Kingdoms to the north. Nrein studied the wide, double-masted ship, her white sails unfurled to catch every bit of wind their frantic Windwarden could muster, desperate to escape the Iron Horse. Pleasure tingled through the extremities of the tall man, his skin the same Agerzak pale as Wierf. Worn, leather trousers girded Nrein’s legs, the brown fading at the creases of his knees and groin. A vest left open exposed chests muscled by conflict and marked with puckered scars. His smile grew as he savored the whaler’s plight. He’d repainted his ship’s hull—a converted, Vaarckthian corvette—a deep black, her sails dyed bright-blue. A symbol to all who saw her, a totem of terror. The Bluefin Raiders prowled these skies. His ship flew faster, her wooden hull sleeker than the whaler’s; the warship was built not to carry vast quantities of rendered blubber but to soar through the skies and bring swift death. No Bluefin Raider, no Agerzak, ever pirated from a ship. “Faster,” he growled to the brown-skinned, Vionese Windwarden standing nearby on the deck. The wisp-thin woman swallowed, an iron slave-collar tight about her throat. She possessed the fine, golden hair of her weak people. “Yes, sir,” she whispered, head lowered like a horse broken to the saddle. The winds about the Iron Horse howled faster, her sails billowing beneath the sudden gust. Captured sailors—mostly Vionese, but with a smattering of coal-skinned Vaarckthians—bustled in the rigging and about the deck, crewing the ship for the Agerzaks. Lacking the False Sun’s Gifts, the Agerzaks possessed no tradition of sailing. They couldn’t conjure the winds to drive vessels across the sky between floating skylands nor could they charge the crystal engines that kept the wooden sailing vessels afloat. But the Vionese were pathetic, easily cowed by the pirates. Nrein pushed one of his three long, black braids off his shoulder, an excited smile on his pale, youthful face. A long scar running across his right cheek and the bridge of his nose marred his handsome features. His almond-shaped, amber eyes gleamed with lust for the whale oil carried on the Arshion. For two years she’d plied the Great Empty, her tanks brimming with the liquid wealth. “Keddalr, prepare your men,” Nrein commanded, his voice rasping like gravel grinding on iron. “Aye, Cap’n,” grunted Keddalr, commander of the archers. The pirate captain smiled, the blood lust pumping through his veins to claim another prize. He needed another Windwarden along with more whale oil before he would meet with the Vaarckthians. No Agerzak pirate would be as feared or remembered as him. The Autonomy would use his name to scare their children into obedience for a thousand years. He would crush their Eastern Fleet and pillage every last one of their whalers. Horses whinnied on the central well deck, lower than the stern or fore decks. Keddalr and his four men wouldn’t fail Nrein. Leather creaked and horses nickered as their bare-chested riders climbed into saddles. With a whoop, Keddalr danced his horse into the sky. The five raiders rode past the front of the ship, their brown stallions galloping upon the sky as if it were firm ground. Sparks flared every time hooves pounded upon empty air. Each rider held short, recurve bows made of whalebone, their woolly, black hair streaming behind them. The five archers raced across the open sky. A powerful ache to gallop with the Skydancers seized Nrein. Out of the Five Gifts of Dhessech, the Eye of the Storm, he possessed the weakest: Fleshknitting. An unmanly Gift that robbed all contest out of battle. He couldn’t dance across the air like his raiders, he couldn’t conjure flame like a Firedrinker, he couldn’t work iron like a Metalforger, and he couldn’t even glimpse the future like a Stormwitch. All he could do was heal; how did that make a fight fun? “Now,” Nrein whispered as his raiders approached the Arshion. As one, the raiders drew back their horse bows and launched the first volley at the fleeing whaler. Sailors dived for cover along the railing as the first sweep of flint-tipped missiles raked their ship. A second flight hissed and fell; a sailor toppled from the rigging. Other manned the Arshion’s gunwales, aiming crossbows. Bolts twanged through the air. Nrein might lose a raider or two, but there was always a Skydancer waiting to enlist in a pirate crew. Offnrieth crawled with them like flies upon pig dung. “Aye,” Wierf answered, then bellowed his command. Green fire erupted in the skies above. Lroff, a Firedrinker, unleashed the signal. For a heartbeat, emerald washed across the Iron Horse’s decks. Nrein grinned, focusing his spyglass on a distant skyreef, a floating skylet too small to build more than a single house upon but large enough to conceal a ship. The Hammer leaped from behind the skyreef, blue sails billowing as she cut off the Arshion’s escape. Eight Skydancers pounded away from Nrein’s second ship. The boarders, led by the madman, Kats, charged the whaler, their greatswords held aloft. All of Nrein’s boarders possessed the iron blades wielded by their ancestors, carefully maintained by Metalforgers down through the centuries. No bone weapon could stand against the strength and weight of an Agerzak greatsword. The sailors on the Arshion were slow to react to the trap. They turned their fat ship south to try to cut ahead of the Hammer while their crossbowmen rushed across the pitching deck to repel the new threat. Nrein loved this moment. He could almost taste the terror of the enemy crew. He smiled as panic rode among the whalers. Their ship handling grew sloppy. They didn’t properly quarter their sails to make the turn. Nrein grunted, feeling the weight of his greatsword strapped to his back. Blood spilled, and he stood safe. Kats and his raiders leaped from the mounts, sailed over the gunwale, and crashed onto the Arshion’s deck. Metal flashed. Crossbowmen fell. Nrein’s hand itched to draw his own greatsword, jump from the prow of the Iron Horse, and somehow cross that distance to join the fray. A man only lived when fighting. Nrein loved the fiery pump of his heart as his enemy tried to gut him with a bone saber. He’d laugh as his greatsword cut down his enemies in a spray of red. Months had passed since Nrein’s last taste of battle. Using ships had downsides. More success, more wealth, but he missed riding on the back of a raider’s horse out to a ship to butcher . . .
“You have the slave-collar?” Nrein asked. The oily Vaarckthian would soon deliver a third ship; Nrein needed another Windwarden to control it. Without Riasruo’s Blessing of Wind, his new ship would be useless. When her engine’s charge ran out, she’d plummet into the Storm. “There it is.” An ugly laugh rumbled from Wierf’s throat. From the Arshion’s stern waved a white flag with a yellow sun surrounded by five golden feathers—the symbol of their pathetic Goddess. A plea for quarter. “Blue flame, Lroff!” Nrein ordered. Sapphire bathed the skies. The archers stopped their volleys. The boarders halted their carnage, quarter given. The press-ganged sailors maneuvered the Iron Horse to the Arshion while the boarders’ horses ambled across the sky. With their saddles imbued with the Skydancer’s power, they could walk the sky without their riders for a time. Pirates on the Iron Horse threw bone grapples attached to flaxen ropes. They hooked the gunwale of the Arshion. With grunts, they pulled the floating ships closer together. The metallic tang of spilled life filled Nrein’s nose. Crimson puddled across the white-yellow deck of the whaler. The dying moaned and gasped, their crewmates tending to severed limbs and spilled guts. When the ships came close enough together, pirates shoved gangplanks across the gap between them and crossed. Nrein followed, his stomach churning as he stepped onto the narrow wood. The Storm boiled hungrily below. He didn’t rush—he wouldn’t ruin all his ambition by falling. He stepped onto the blood-soaked deck. A bony-faced woman in fine trousers and a double-breasted jacket climbed down the stairs from the stern deck. She strode with a brittleness towards him, her brown face paled to a jaundiced tan, the mask of her haughty authority cracking beneath the violence splattered across her deck. She kept her eyes fixed on him, not watching where she stepped like she didn’t want to witness the butchery. She swallowed, her red eyes wild with dread. She flicked a greedy gaze to the holding tanks on the Iron Horse. She still wore her bone sabre, her fingers twitching. Nrein’s smile deepened, welcoming her attack. His blood pounded through his body, carrying that wonderful thrill through his veins, cold and exciting, sharpening all his senses. Her eyes darted around as his crew watched, hungry. She relaxed; disappointment soured Nrein’s guts. A young man, two jowls quivering, lumbered forward. One glance at his soft, pampered body proclaimed him the Windwarden. Essential for a ship’s survival, they always enjoyed the best food and little labor. This carp appeared to never have done a day’s work, or missed a meal, in his life. “What?” blubbered Grioch as Banch—a huge man with thickly curled, white hair—marched towards the Windwarden, a metal collar in hand. Grioch bolted. He barreled for the stairs down into the hold. Kats thrust his greatsword out before the fleeing piglet. Squealing, the Windwarden halted his waddling flight before he cut himself on the sword’s gleaming edge. “Where you going, tuna?” laughed Banch, grasping Grioch by the shoulder and spinning him about. “W-what is that?” wailed Grioch, pointing at the collar. He flinched from it before he went to retreat, but Kats raised his weapon, and the piglet’s body locked rigid. What a disgusting eel, Nrein thought, sneering. Grioch trembled, staring askance at Kats’s ugly blade. The collar sprang open—Grioch squeaked—then Banch snapped it about the pudgy man’s throat in a blur of motion. The metal bent back together and melted into a single, solid piece before Grioch could jerk away. Banch stroked a wooden ring on his finger surmounted with a smoky quartz. The collar squeezed Grioch’s neck, choking off the Windwarden’s words. Blubber spilled over the edges of the iron band. His brown face darkened as he struggled to breathe. His green eyes, flecked with red, bulged. Sausage-like fingers pried at the metal digging into the flesh of his throat. Banch seized the Windwarden’s lank, greasy hair. He jerked the tuna forward, staring into those trembling eyes. Grioch gurgled, foam gathering at the corners of his lips. Grioch nodded his head, face darkening towards puce. The metal relaxed. The ball of lard fell to his knees, gasping and crying, despicable tears spilling down his cheeks. Investigator Archene Thugris limped through the pristine grounds of the University of Rlarshon, enjoying the warm, autumn day as her cane thunked on the gray brick path. She passed topiary shaped by the gardeners with their bone sheers into schools of flying fish. Leafy sharks, sculpted out of darker shrubs, stalked their prey, mouths bristling with fierce, bushy fangs. Colorful songfish, the real kind, drifted through the topiary, their fins vibrating to produce sounds to delight the ear. Their humming music danced across her awareness, bringing a rare smile curling the corners of her tan face. The setting sun lit up one side of the Dawnspire that reared to the south of the university. The great tower of crystal thrust high into the blue sky, brilliant fires refracting off its faceted surface. A school of minnows burst from the leaves of a topiary shark—their silver bodies flashing as they flew up into the sky—and startled the investigator out of her reverie. Archene fought to keep her balance, her stiff right leg burning as her boot slid across the pavement. It didn’t move smoothly, her knee hardly bending. Seventeen years ago, during the war, a Zzuki warrior’s claws had mangled her thigh while she had served as a marine. Archene planted her cane hard on the ground, leaning on it to arrest her fall. Her left hand clutched at her double-breasted, black waistcoat buttoned up to her neck. A sharp exhale burst from her lips as excitement bled out of her. Almost two decades with the limp, and she still felt incomplete, yearning to hustle, to run like she had as a girl through the fields of Xojhey. She was lucky to still have a leg. The medical officer had wanted to amputate at her mid thigh, but she’d begged to keep it. “Are you okay, Investigator?” a polite young man asked, dressed in the white robes of a student. His brown hands seized her arm, helping to steady her. The urge to snap at the young man swelled in her along with the embarrassment of her stumble being witnessed. The young man nodded and released her arm. Archene straightened, smoothing her long, black skirt and adjusting her waistcoat. The yellow, double-headed griffin of the Autonomy shone on her breast pocket, marking her as a member of the Office of Special Investigations. Last, she adjusted the bone sabre hanging from a leather belt wrapped about her slim waist, a formality more than a practicality. With her leg, she could not properly fence. Her charge crackled across her skin, itching to flow into the cane. She could feel the engine hidden beneath the carved bone. Though it didn’t look it, the cane was a thunderbuss, capable of discharging her Lightning. It lacked the range or accuracy of the more solidly built thunderbusses the Autonomy’s Navy employed, but its blast would surprise any would-be attacker. Philosopher Rheyn Duthan had designed it for her. The student gave her a friendly smile before striding off towards the College of Esoteric Philosophy where theology and morality were taught. A half-dozen different colleges, each specializing in a different field, made up the University of Rlarshon. The College of Physiological Philosophy taught medicine and trained doctors. The College of Historiography poured over moldy parchment from before the Age of Isolation while the College of Abstract Philosophy lost themselves in numbers and mathematics. But it was the College of Material Philosophy where researchers discovered new uses for Riasruo’s Blessings. They delved into the Sun Goddess’s gifts, uncovering new combinations of wood, gems, and powers, inventing new devices to save labor, or new weapons to wage war. Archene touched her blonde hair, making sure no strands escaped her tight bun before limping onward. Her current assignment was as the liaison to Professor Duthan and his important work. New orders had arrived only an hour ago, the letter heavy in the breast pocket of her waistcoat. Back home, her husband packed for her trip. She fought through the growing fire in her crippled leg her quickened pace produced. Her brown-skinned forehead wrinkled as she fought the discomfort. Ahead, her destination, the College of Material Philosophy, rose, a three-story, rectangular box constructed of gray granite mortared precisely together. A roof of red slate gleamed in the setting sun. Many classroom windows were left open to let in the cool breeze. Wedges held open the main double doors. She passed through them, the thunk of her cane transforming to a deeper thud as it struck the polished granite floor. More students in white strode down the halls, their youthful faces full of excitement as they talked. They fell silent as she limped by. Archene could hear their thoughts whispering, “Griffin,” the nickname given to investigators. Like the fierce, wild red-crested griffins that dwelt on the skylands of Les and Vion, investigators were tenacious, tracking down their quarries with a single-minded ruthlessness. When a great crime was transgressed against the Autonomy, the griffins would swoop in to hunt the miscreants. Archene paused when she rounded a corner to face the heavy oak door that led to the basement. A bored marine, Private Dharsene, lounged against the wall, his redcoat half-unbuttoned. Archene’s lips pursed at his slovenly discipline. Her cane thudded as she trooped down the hallway, left foot planting hard, the right half-dragging across the stone. The marine opened the door, his green eyes trembling. She fixed him with her hardest stare, the color paling from his brown face. She swept past him and labored down the narrow stairs. They were the worst to navigate. She had to go carefully, bracing her left hand against the coarse stones of the wall as she placed her cane on each runner. If she rushed . . . Step by grunting step, she worked her way to the basement hallway, sheens of sweat beading on her forehead. She paused at the bottom, heart laboring, shoulders rising and falling with deep breaths inhaled through her nostrils. Cool, damp air wafted around her, and a faint tinge of must wrinkled her nose. She dabbed at her forehead with a handkerchief produced from her waistcoat’s pocket as she stared down the long hallway before her. Whale oil lamps, set in the wall, lit it, leaving gulfs of darkness between each skyland of light. A woman’s faint, muffled moans echoed. The sounds of Philosopher Duthan’s research. Her cane echoed louder in the narrow corridor as she stomped forward, passing wooden doors with barred windows. Another marine, almost a shadow in the dark hallway, guarded the final door. The cries of pain grew louder, gut-wrenching whimpers and heart-palpitating shrieks. Flickers of blue-yellow light bled through the gaps around the door. Archene’s stomach twisted. She pushed down her revulsion. The Autonomy’s protection was worth any cost. “Inspector,” the straight-backed marine said, saluting with alacrity, her voice calm despite the screams of pain. “Corporal,” Archene nodded as the marine opened the door. Inside, a woman lay strapped to a plain, wooden table, her half-naked body wizened to spindly limbs. Only a thin, dirty-gray smock covered her almost fleshless body. Agony dulled her green eyes, her shriveled lips squeezed tight. Bone needles were inserted into her arms, legs, stomach, and neck, each tipped with a sliver of rose quartz encased in a small frame of black hickory. They were one of the inventions of Philosopher Duthan and were an effective interrogation device. They allowed a person with Minor Lightning to deliver painful, though not lethal or incapacitating, shocks of static charge merely by brushing the ends. Blue-yellow light arched from Duthan’s finger to the needle, bathing the dark room in harsh light. Archene battered down her motherly sympathy. She gritted her teeth, forcing herself to watch as Nianie’s body jerked, her piteous screams echoing through the room. Five years ago, the Cyclone of 394 VF had attacked the skyland of Humy. The warship, Courageous, sallied forth to fight it. The corvette had sustained grievous losses, and Able Sailor Nianie Srlyene was struck by lightning, tainted by Theisseg. Per regulations, the Office of Special Investigations had quarantined her. For three years she had been well cared for, kept in a pleasant cell at Rhision Prison at the south end of Rhogre. Rumors of her strange dreams had peculated out. She was the second Autonomy sailor ever to be tainted by Theisseg. The first was a madman, raving in his cells for a decade before dying. No one paid his words any attention until Philosopher Duthan had heard the rumors of Nianie. Then he had arranged to study her. Cyclones were on the rise. The destructive tempests that rose out of the Storm Below attacked the skylands with greater frequency. The Stormriders, the Dark Goddess’s servants, reaved and pillaged wherever they appeared. The Autonomy needed to know what secrets Theisseg had implanted in Nianie’s mind, to understand why She communicated with the mad girl. “Tell me about the dream,” Philosopher Duthan demanded, his wrinkled face furrowing. The lightning chart was an amazing discovery by Philosopher Duthan. Thirty or so years ago, his research had uncovered a new use for Major Lightning. Disturbances in the Storm Below caused by Cyclones rising could be triangulated. The Office of Special Investigations had leaped on the discovery. Two were built, always manned by a cartographer and a courier, one on the northern end of Rhogre, the other on the southern end. With precise compass bearings taken, the mathematics could triangulate the disturbance. It had taken over two decades to survey the skylands of the Autonomy and fix their position on a coordinate system to make use of it. And your interrogation hasn’t helped, thought Archene, bile gurgling in her stomach. “Shadowed death . . . comes to dance . . . with my hero . . . and the . . . burning woman . . .” sobbed Nianie in her breathy chant. “Yes, yes,” Duthan muttered, furrowing his forehead as he listened to Nianie’s sobbing words, absently stroking the few wisps of white hair circling the crown of his spotted head. If Archene’s memory held, three crews trained at Camp Chubris, almost ready to take up their duty for the Autonomy’s Navy. Please let none of them be tainted, Riasruo, she prayed as she stomped out of the interrogation room, blue-yellow light flooding around her. Archene knew she would deliver any she found. None tainted by Theisseg could be allowed to roam free. 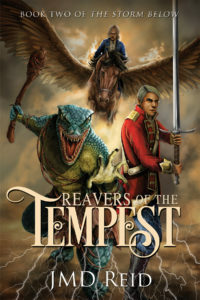 If you want to stay informed on my writing and Reavers of the Tempest’s release, sign up for my newsletter and receive a free fantasy story!